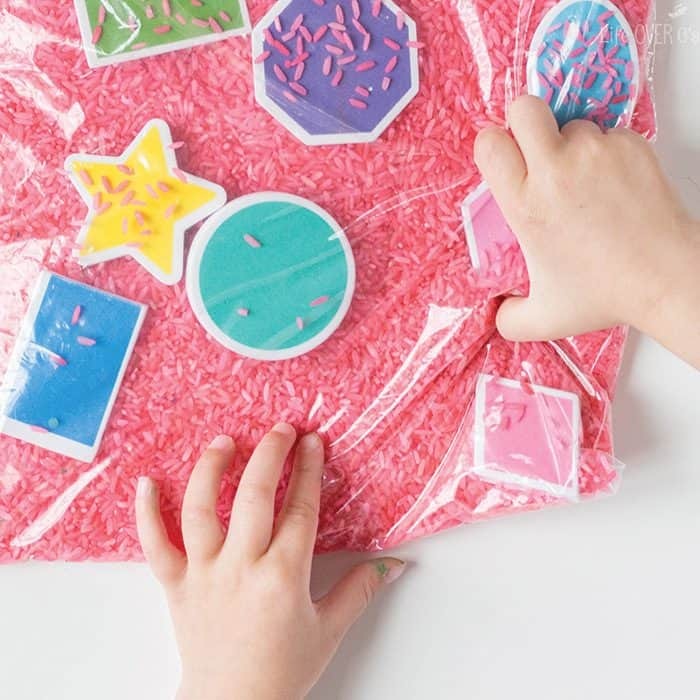 This foam shape sensory bag is a perfect example of a simple activity for kids! Prep it in way less than five minutes with sensory materials you already have on hand. 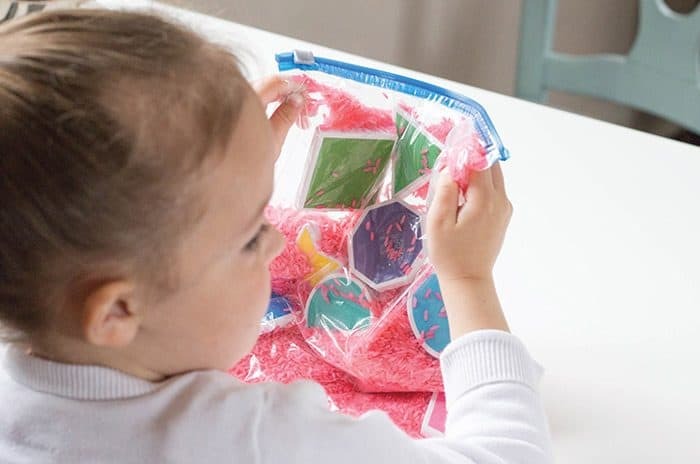 My preschooler loved this because we’ve been using these shapes for lots of activities over the last few months and because she loves sensory bags. I love that it doesn’t make any mess! To prep: Pour the rice into the bag and add the shapes. Seriously. That simple. We actually keep a supply of pre-dyed rice on hand to make spur-of-the-moment activities. We have pink, red, purple, blue, and green right now. Oh, and the yellow we used for our sunflower sensory bin. The great thing about sensory materials is that you can use them more than one time. So even though you may be using food products (ours were all expired), you’re not just using it one time and then throwing it away. We even keep rice from sensory bins that were multiple colors and then mixed together like our red, white and blue sensory bin. The color mixture is gorgeous and still fun to play with! 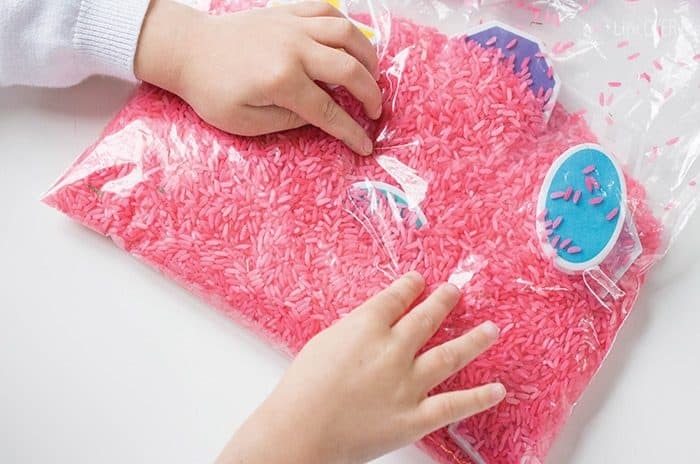 If you don’t already have some dyed rice on hand, you can always use plain white rice or it is super easy to dye rice using these simple instructions. 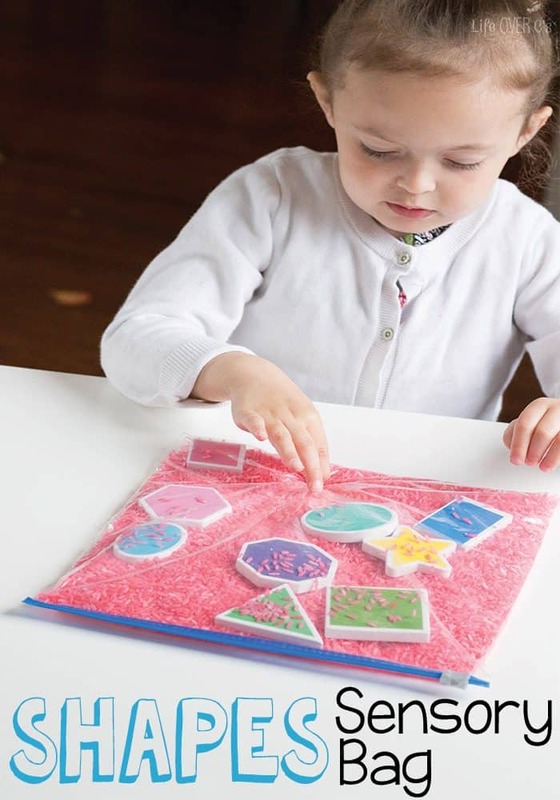 Play I Spy- Lay the bag flat with most of the shapes showing and have your child “spy” the shapes as you call them out. Play Hide & Seek- Shake up the bag until the shapes are hidden within the rice. Then go on a hunt for the shapes. 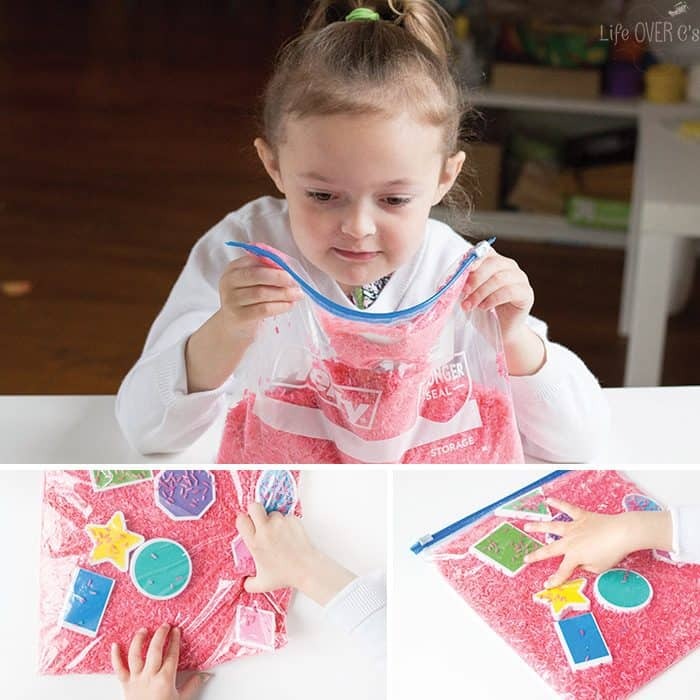 For an added fine-motor challenge have your child do it with one hand or with one finger from each hand. Have your child trace the shapes with their fingers. Practice counting by counting sides or points on each shape. With a colorful set of shapes you can also learn color names. We love to use sensory activities for language development. My daughter is in a stage in which she loves to mimmic everything that she hears. The word ‘octagon’ was so much fun! For younger children, you could start with fewer and more common shapes such as the square, circle and triangle. Shiloh isn’t ready to learn all the bigger names of the shapes, but she needs an added challenge picking out the simple shapes, so having some extras in the bag was great for her. 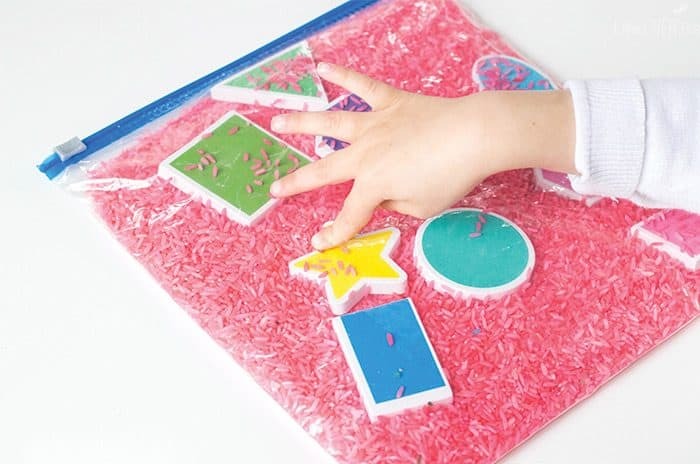 Create your own Foam Shape Sensory Bag today! Then check out some of our other fun shape activities! Your foam shapes are different than the link, where did you get those? I like how the white defines the shape! I got the shapes that I have in the Target baby section (where they have all the bath toys), but it has been a couple years, so I’m not sure if they still carry them.